If there is one thing cats are good at, it’s hiding pain and discomfort. Unfortunately, this means that cat owners may not even realize their pet is in pain or ill until something serious occurs! Below, a Waterloo veterinarian discusses five signs of sickness that you should be on the lookout for. Does your cat usually cuddle up to you affectionately, but now doesn’t want to be anywhere near you? Does she usually remain independent, but now is whining at you constantly? Behavior changes like these could indicate pain. Your cat may be trying to tell you something, especially if they’re more vocal than normal. Aggression and skittishness are other possible signs, so call your vet if you notice anything unusual. A cat’s coat is one of the best indicators of her health on the inside. A dry, dull coat, excessive itching and scratching, bald patches, or even an increase or decrease in shedding could mean something is wrong. Set up an appointment with your veterinarian to discover if there is an underlying cause, and how it can be treated. Kidney disease, gum disease, and cancer, among other maladies, can all cause a cat to stop eating and drinking normally. Some illnesses, like diabetes and inflammatory bowel syndrome, may actually cause a sudden increase in the amount your cat consumes. If you witness under-eating or overeating, or an increase or decrease in water consumption, let your vet know. Try to sniff your cat’s breath every once in a while. It may not be lovely, but especially offensive breath can indicate disorders like periodontal disease, kidney problems, and infections. Fruity and sweet breath is a classic sign of diabetes. 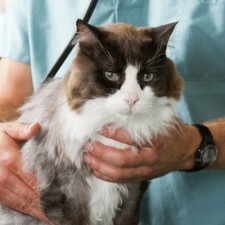 Your veterinarian should be informed as soon as you notice changes in your cat’s breath. Has your cat’s stool changed in terms of color, size, smell, or frequency? Does she seem to be urinating less or more? Waste changes like these could be indicative of various disorders, including urinary tract infections, which are relatively common in cats. Keep your Waterloo veterinarian’s number on hand to call as soon as you notice these changes. Your cat may be good at hiding it, but a watchful eye can spot health problems in even the most stoic feline!